We’ve all had those days when as Robert Burns so aptly said “The best laid schemes o’ mice an’ men, gang aft agley”. Sometimes it’s a whole week like that. March has been that kind of a month. Synchronicity is that thing that happens when all is right with the world and everything falls into place just as it should. Sometimes when plans go awry it is because synchronicity happens. Whatever I was planning wasn’t as fun, important or rewarding as what the shift in plans brings. For me, these usually involve avoiding a chore. In March I was settling in for an evening with nothing on tv and no promising books to read when I got a call from an old friend I’d not heard from for months. I was going to get some writing done and a friend stopped by and we stayed talking, catching up, for hours longer than a quick visit. I was going to do laundry but Karina needed me to be Mom and listen to her rant about the crazy in her life. “Oh well, it was meant to be.” “It’s a good thing I hadn’t really started yet.” “I’m so glad this opportunity came along.” Synchronicity. Then there are those times when it seems we can’t do anything right. I had a few of those too. Days when I would wake up with good intentions only to check Facebook and disappear down the Tube of You until it was too late to run errands. Days when the phone wouldn’t stop ringing with calls from telemarketers, appointment reminders, and the I don’t have anything to say so I thought I’d call you friends. These days are kind of the opposite of synchronicity. They are the days when I know I am fighting my alignment with the universe. I could get on track and do what I need to do, if only I’d get my head out of the sand. I’ve had a couple of no good, horrible, very bad days (maybe I should have moved to Australia with Alexander). The worst one included misplacing my best serving trays which I’d promised on load for the weekend, not being able to find my fondue pot which I needed for a dinner party that night, driving to 4 thrift stores and finding several trays but no fondue pots, hearing from the woman I was borrowing a second fondue pot from that she was sick and wasn’t coming, dropping the bottle of wine I had bought special on the tile floor and breaking it in the bag of everything else I had packed for the evening, the toilet backing up, finding my fondue pot had been sitting under a drip in the ceiling for what looked like a century…….. In the end it all turned out just fine. The dinner party was with my best girl friends and they were happy just to be together. The trays were eventually found. I managed to borrow all the fondue pots I needed from another friend in the nick of time. But apparently I’m not done being derailed. I had several ideas for my Monday blog this week. I spent the weekend off in the woods of Wisconsin. Packed my camera. Never took it out of the bag. I played with the dogs. Watched a very smart turkey grab the branches of saplings and bushes and let them go sprong so that all the seeds and new buds would fall on the snow for him to eat. Had a delightful relaxing time. 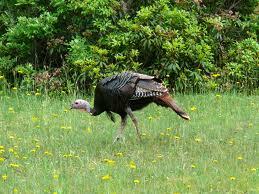 But not anything to write about (except the turkey) and no photos. I have been thinking for a week about an article in response to some things I’ve been reading in the blogosphere. An article that is ripe for controversy and needs to be carefully crafted to actually say what I mean. An article requiring a block of uninterrupted quiet in order to write it. Of course Orion was home sick yesterday. 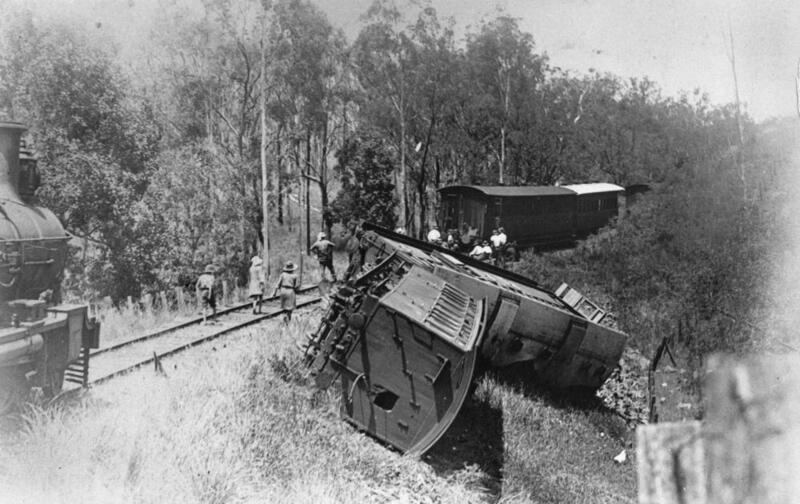 Derailed again. I’m looking forward to April. Do you think I’ll manage to get past the 1st? Orion ‘watching the coffee pot’ and taking a break from welcoming folks to the suite. 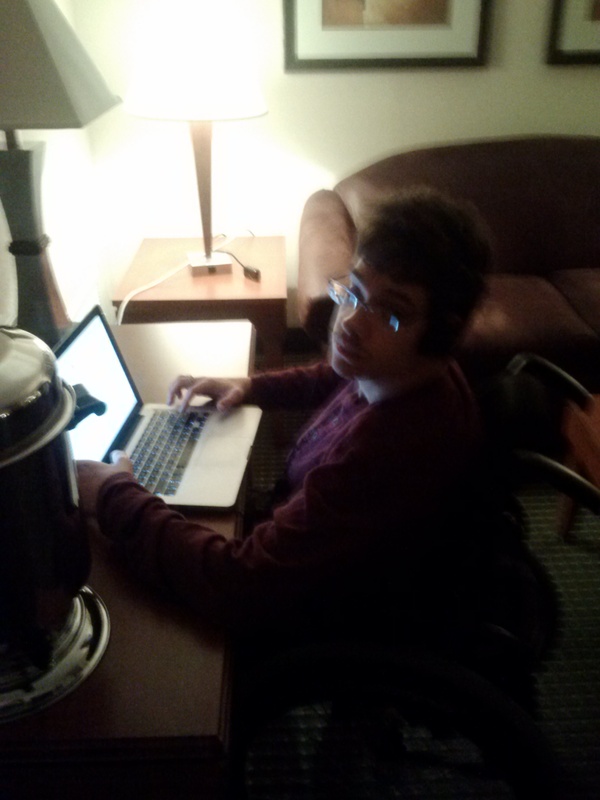 Orion and I spent the weekend in a hotel room. We were there as volunteers to keep things tidy, put out food, answer questions and talk to folks. 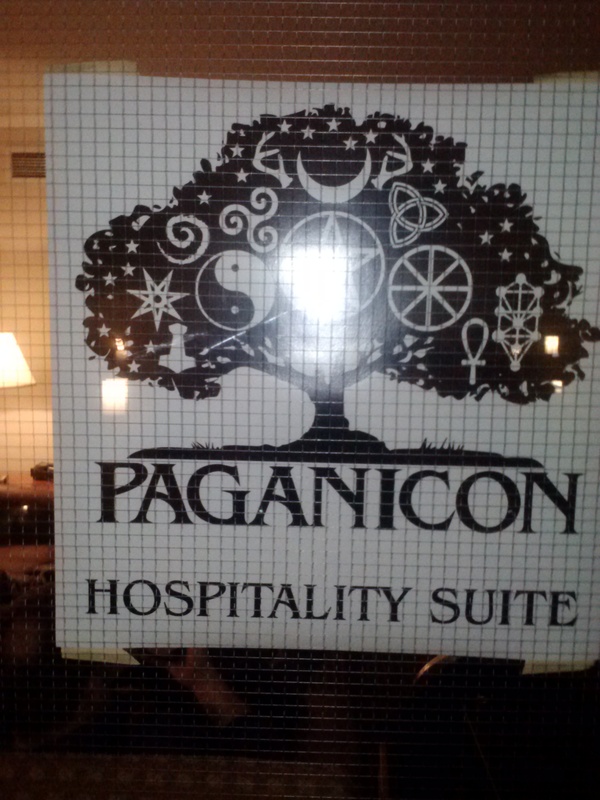 Actually we didn’t even stay at the hotel, just spend long hours hosting the hospitality suite – the actual con suite -for Paganicon. Our local Pagan Pride event has been going on for years in the Twin Cities (Paganistan) area. They’ve held events that were like weekend psychic fairs or community meet and greets. They’ve had Big rituals and small workshops. A couple of years ago it became clear that Pagan Pride needed to serve two purposes. First to be “out loud and proud” in the larger community. That’s kind of tough when your event is holed up in an odd community building off the beaten path. The second purpose was to provide an opportunity for those who’ve been long time members of the community to network and expand their own knowledge base. To become an event that went beyond 101. In 2009 Pagan Pride started doing a fall event with vendors, music and public rituals in an outdoor setting. Pride at Minnehaha Falls is an event that the general public can see and participate (or not) along with the existing and exploring Pagan community. It’s a great idea and a pleasant historical venue. The “meeting place of waters” is appropriate for expanding awareness and acceptance. In 2010 Pagan Pride held its first Paganicon. A hotel based convention loosely modeled on Pantheacon. This is still a small convention but it has good buzz. I haven’t gone in years past because of scheduling and money issues but I’ve certainly heard about it from the community at large. The convention/fair model seems like an excellent expansion of Pagan Pride for this community. I don’t know if I would have made it to the convention this year either. Money is tight since I came back from California. Orion is not too keen on sitting through the workshops I’m interested in, and he’s not quite independent enough to manage a convention on his own. We come as a pair most of the time and for a weekend long event I certainly couldn’t afford to get away. At the last minute the Pagan Pride committee discovered their regular “Suite Goddess” was swamped at work and were scrambling for someone to take her place. It sounded like the perfect solution to my predicament so I signed us up. 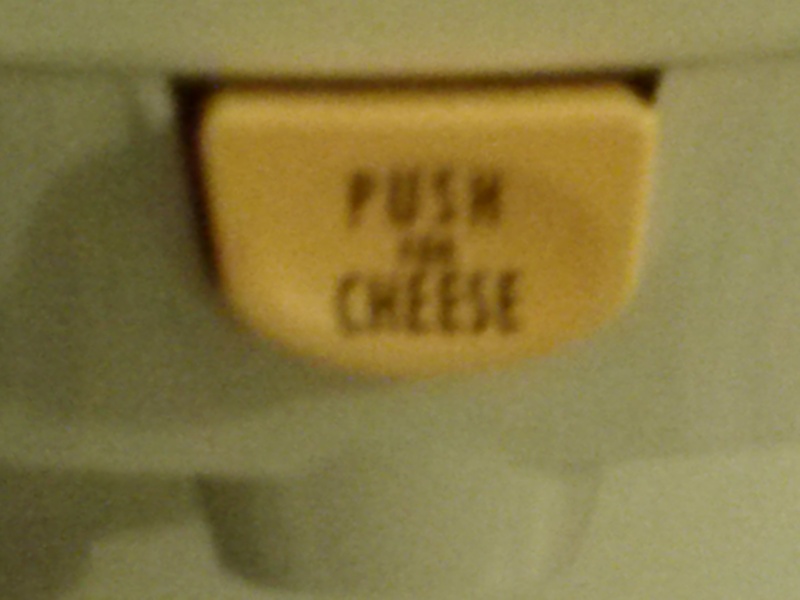 “Push for Cheese” What could go wrong? Someone asked me how I managed to deal with “missing” all the workshops and stuff. Essentially ‘why would you do so much work when you don’t even get to go to the convention?’ My feeling was pretty much that the convention came to us. Sometime during the weekend almost everyone attending made their way through the hospitality suite for a cup of coffee, or a snack or to sit for a minute and chat. It’s not like we were all alone. The roving volunteer crew – the “Flying Monkey Squad” – were available if we needed help lifting heavy things (like coffee urns). Often they sat “on call” in our suite knowing that when they were needed this was where people would look. 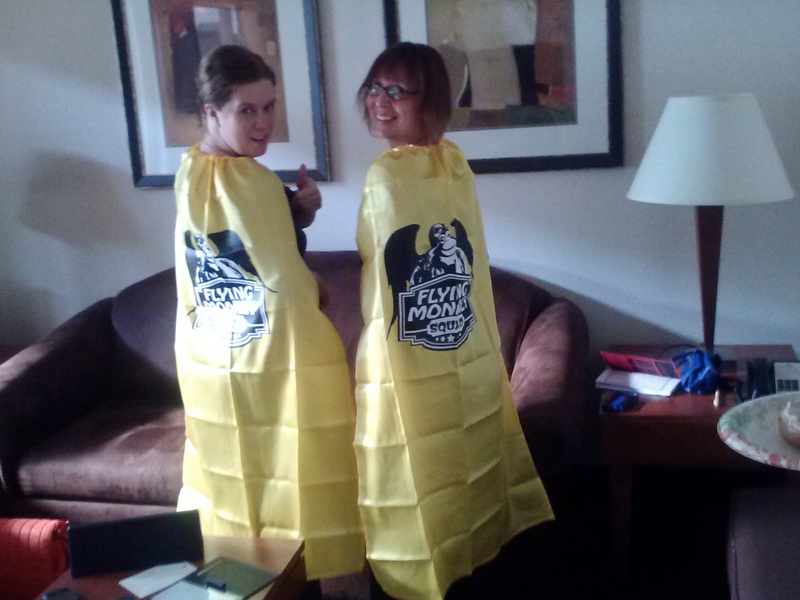 If nothing else they swung by to get those fabulous capes to wear during their shift. There were several times during the weekend when we were “standing room only.” People would come in crowds talking about the workshop they’d just attended. Or they’d sit for a minute before the vendor room or the ball opened up. I did manage to stick my head into the vendor room (and immediately left lest I be tempted.) I also got to wander through the art exhibition which was a new and delightful addition to this year’s convention. Yet another opportunity for me to explore community and my relationship to it. Again I got to meet new people and visit with old friends. It was nice to have an opportunity to be of service to something I support and still reap the benefits of the social support of community. I’m pretty sure Orion had a great time too. Win/Win. It really doesn’t happen to everyone! Dragging through Daylight Savings in the spring is a national pastime. The local coffee shop offers an extra depth charge of espresso just to help get through that first Monday. There are incidents of people showing up late (or arriving unexpectedly early) to classes and appointments. Then there is the changing of the clocks. People in my generation seem to have to relearn how to reset the DVR every 6 months, like it’s the first time. My parents will wait until one of the Grandchildren show up and just add the hour in their heads. Then there’s the clock that we, ooops, forgot to change. Mine is usually the one in the car, or the watch I rarely wear, or the clock that I have in my bedroom that I can see (which is not my alarm clock). I can’t decide if the world of satellite connection makes this easier or harder. 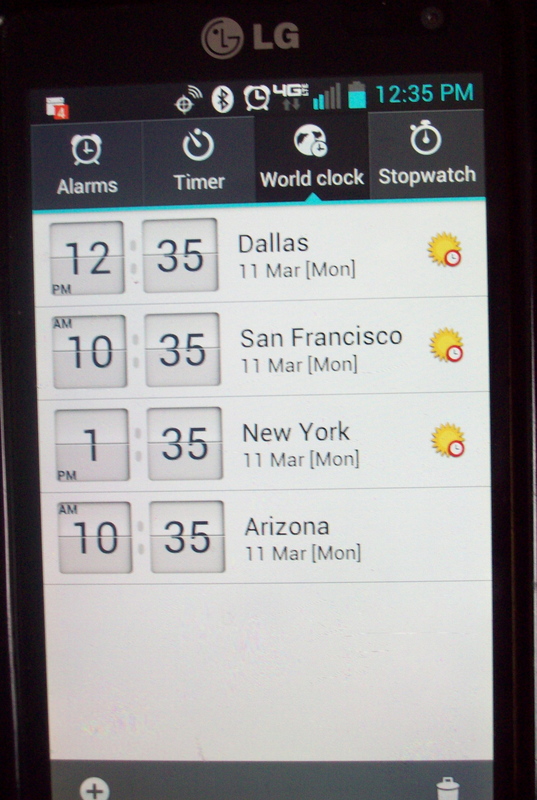 My phone clock changes automatically (at the discretion of the service I use.) 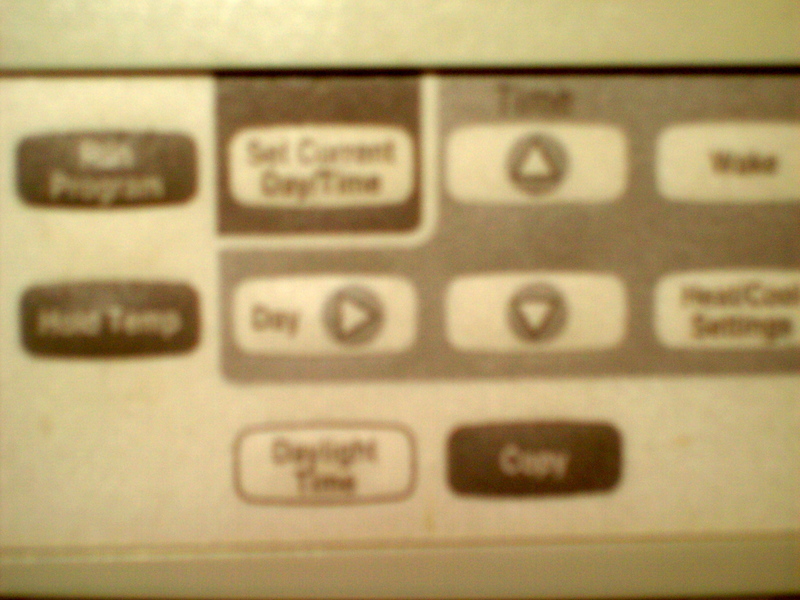 My TV timer changes automatically (which means I don’t miss the shows I program). 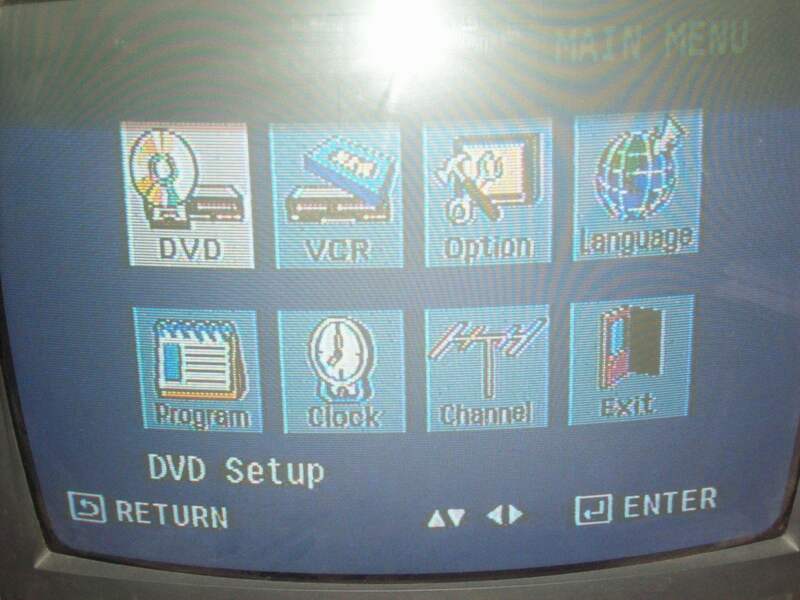 I just have an old-fashioned DVD/VCR attached with the clock that I actually use that needs changing. Even my alarm clock (because I use my iPad) switches automatically to the correct time. So why do I have to change everything else by hand? At least the thermostat has a button! Daylight Savings Time did not take me by surprise this year. I saw all the meme’s on Facebook. I even reminded my daughter to change her clocks. Somehow I never internalized that this all applied to me as well. Sunday morning the alarm went off (on the automatically changing iPod) and I looked at the clock and it wasn’t right. That late night that Sunday morning would make up for was much shorter than I’d intended. Silly me I over booked my Daylight Savings Sunday. Sunday is my “day off”. I get Orion up and dressed and then he goes off for the day with his father returning in time for bed. (You see that my “day off ” isn’t quite a freebie, but Orion’s Dad may or may not be on time and, unlike the weekday bus, he’ll wait if Orion’s not quite ready.) This Sunday I had a luncheon date and a class to teach – AT MY HOUSE. Now I am not a great housekeeper. Honestly, I’m not even a fair housekeeper. People coming over requires a certain amount of attention. Making this even harder, I’d shorted myself time to “pick up” by having the lunch date. Then it was Daylight Savings Time on top of it. What was I thinking? That somehow it didn’t apply to me? Orion at Dinner. 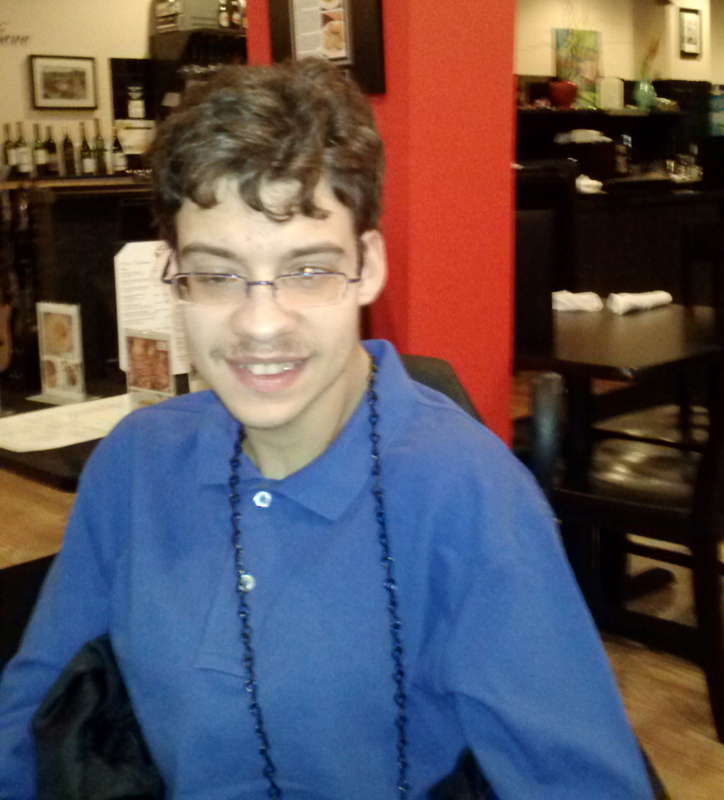 He chose a Brazilian Restaurant. Doing a lot of in and out of the car with Orion and the Wheelchair is one of those little parts of my day that aggravate my back. Saturday wasn’t too bad. I was having a good day. I took it slow. 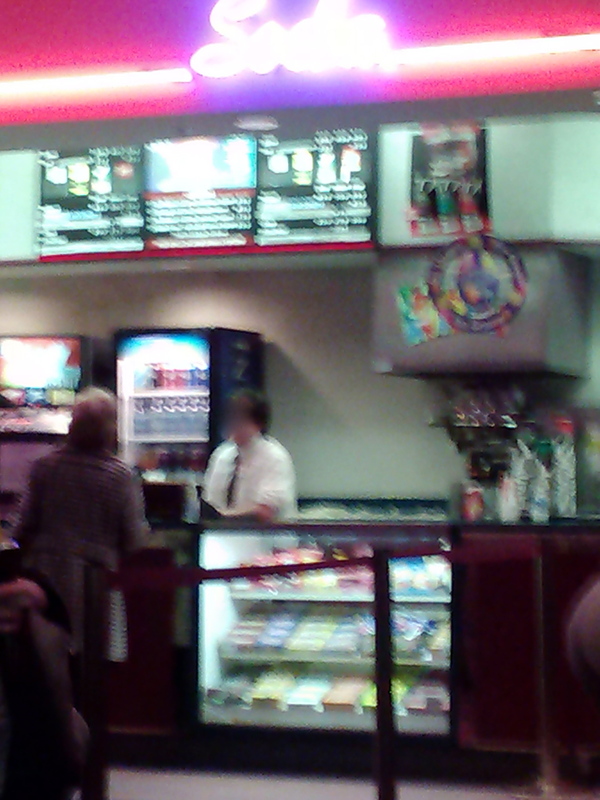 Sure it was cold and rainy, yes there was a lot of walking associated with those errands, and parking, and standing in line at the movie theater. My back acting up will keep me up later at night. Sure it makes me more tired, but also less comfortable and ready for bed. I look for distractions which make it easier to lose track of time. Going to bed with my back acting up I either take the heavy duty meds and am a little groggy in the morning or I just don’t sleep well and need a little longer to feel rested. I opted for the later because, surely, Daylight Savings Time doesn’t apply to me? 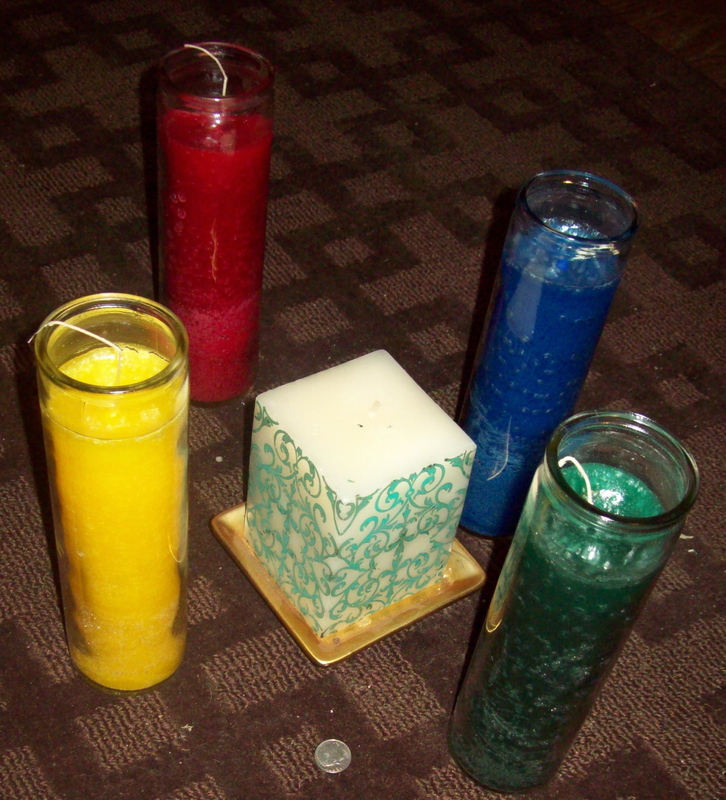 I was on Pagan’s Tonight Blog Talk Radio, The Priestess Show last Friday and we were talking about spells. Somewhere doing the interview I promised to write more about spell work on my Monday blog. So here goes. One of the most interesting things that I got out of talking with Stephanie Neal was the idea that we are the spell. That everything we do has an effect, an impact. That all of our words, our thoughts and our actions move out into the world and interact with it for good or ill. This idea is not new to me, but thinking of it as a spell is. We are the spell we put into the world. What we send out grows like a seed. What comes back are the fruits of our spell. We are the spell we put into the world. – It ought to be some kind of a chant, don’t you think? That reminder, that focus of our intention is the core of spell work for me. I know that when I focus my intention and truly put my desires out I have seen miracles. I also know that the thing most likely to interfere with that process is me. I am extraordinarily talented at getting in my own way, I think most of us are on occasion. If my core belief is that love is pure energy; That it is abundant and ever renewing; That love is something that grows when it is used; there is no call for that kind of judgment. There is so much out there bigger than I am. There is so much out there with a wider vision, a broader perspective on the arc of my life that I have. What do I know about what I might and might not be able to achieve if I plant that seed of desire? We are the spell we put into the world…..
We touched a little bit in the interview on timing. We talked about the people who consult the astrology charts and have to do their workings in the proper timeframe with the exact ingredients with all the right associations. Not to dismiss that process because all those things do help. The more meaning built into what we are doing the more likely we are to succeed. Doesn’t that apply to everything? What we didn’t talk about is that space before taking an action. That space where we do a divination or sit in meditation to find if doing a spell is what we really need. When I said sometimes the best spell is a shot of scotch and stepping up to the plate I really did mean sometimes just sucking it up and taking direct action is better that crafting a spell. Think about it this way. If you are looking for a job you can do a spell to make a job fall into your lap. Or you can get your resume together and start stopping in at businesses and making phone calls. Which is more effective? Asking the Universe for a job or asking a potential employer? But sometimes we need both. Sometimes doing the spell is what we need to step into that interview process with the confidence that you deserve a job. Sometimes doing the spell is what allows us to look “outside the box”, potentially applying in a different field or asking for the promotion to a different department. But it doesn’t work the other way around. Just doing the spell and not doing the legwork isn’t getting us anywhere. The best spell is sometimes BEING the spell we put out into the world. I want to be a successful author. 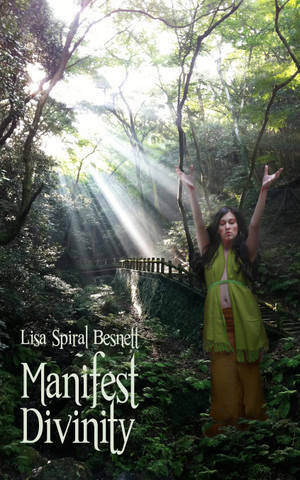 I want to promote and sell my book, Manifest Divinity. So when I crafted the prosperity spell I performed on the air I took a look at all of those things. How do I get in my own way? I need to allow my passion to be seen rather than “hiding my light under a bushel.” I need to take the opportunities I’m given to speak about my work. I want to make sure that what I am putting into the world is growing energy, benefiting others as it benefits me. I looked at what would it take for me to believe in that kind of abundance as it applied to my own prosperity. Spirits of the North I call to you and ask your aid in increasing my prosperity. May there be increase in sales of my book as a symbol of increased prosperity. Spirits of the East I call to you and ask your aid in increasing my prosperity. May there be increase in my ability to promote myself and my work, especially my book. Spirits of the South I call to you and ask your aid in increasing my prosperity. May there be increase in my efforts to share my passion for the book I’ve written. Spirits of the West I call to you and ask your aid in increasing my prosperity. May there be increase in the flow and exchange that what prospers me prospers others. I place this dime within the circle of elements. As like attracts like so may I see more money coming into my accounts. 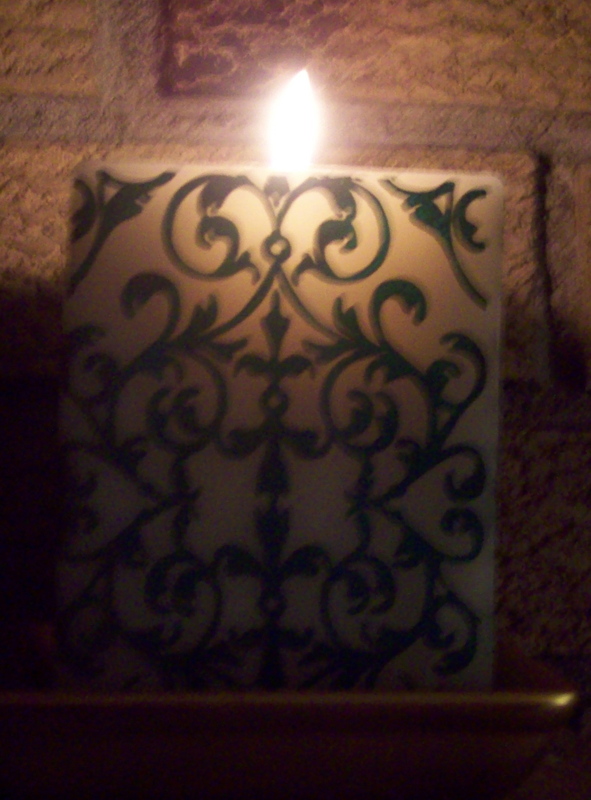 I light this candle to charge this spell. While it burns may the gifts of the elements work within me. May this spell flourish and bring bounteous fruition by the time the flame burns out. I ask the blessing of the Lord and Lady upon my work and upon this working. We did the show on Friday night. Sunday I got an email from my publisher (Immanion Press) with the contract for a poem I wrote to be included in an upcoming anthology on Pagans and Disability. This is a piece I submitted almost a year ago. Go figure. We are the spell we put into the world.